Watt had four tackles, one sack, two tackles for loss and a pass defensed in Thursday's win over the Dolphins. Analysis: Watt made life difficult for tackle Ja'Waun James, who eventually needed assistance in the form of a double-team. The sack was Watt's eighth of the season, putting him back in a tie for league high with the Rams' Aaron Donald and the Vikings' Danielle Hunter. Watt recorded three tackles and a sack in Sunday's win over Buffalo. Analysis: After a slow start to the season, Watt has recorded at least one sack in four straight games, giving him 7.0 for the season. That ties him with Minnesota's Danielle Hunter for tops in the NFL. Watt had two tackles and a sack during Sunday's 19-16 victory over the Cowboys. Analysis: Watt now is tied for the NFL lead with six sacks, with all of them coming in the last three games. Teammate Jadeveon Clowney's recent dominance on the defensive line has aided Watt's pass rush, and the latter seems to have picked up right where he left off after injuries limited him to just eight games over the past two seasons. 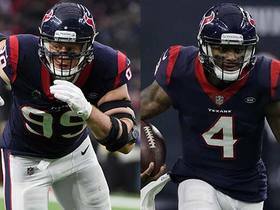 Watt had four tackles, two sacks, four tackles for loss, one quarterback hit and forced two fumbles, one that led to a touchdown, in Houston's Week 4 win over Indianapolis on Sunday. 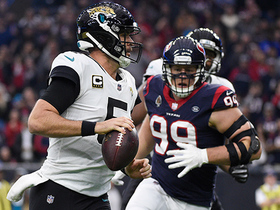 Analysis: It took Watt a couple of weeks before rounding into form, but he now has five sacks and three forced fumbles over the last two weeks. 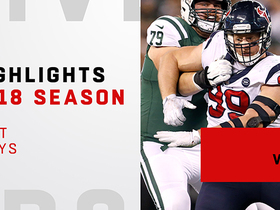 Watt recorded eight tackles, three sacks and a forced fumble in Week 3's loss to the Giants. 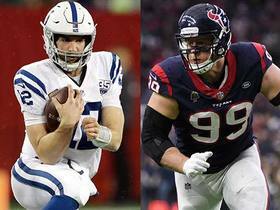 Analysis: These were Watt's first sacks since September of 2016, as the three-time NFL Defensive Player of the Year has been dealing with injuries since. After such a long layoff, it took Watt a few weeks to regain his form, and his three sacks lead the Texans. Watt had three tackles and two quarterback hits in Sunday's 27-20 loss to the Patriots in Week 1. Analysis: Watt was initially quiet, but he started getting into the backfield more often in the second half. While he didn't get credit for a sack, Watt created the pressure that forced New England quarterback Tom Brady into the waiting arms of D.J. Reader. It was a good effort by Watt, who was limited to eight games played over the last two seasons by back and leg injuries. 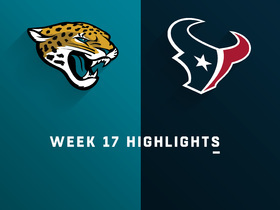 Coach Romeo Crenel is optimistic that Watt will not be limited in Sunday's season opener against the Patriots, Sarah Barshop of ESPN.com reports. Analysis: "Right now he's been doing OK in practice," Crennel said, "so he should be there." Watt was heavily limited throughout the preseason, playing only three defensive series in one game against the Rams. While it's hard to say whether Watt will ever have the same impact as during his historically dominant 2012-15 stretch, the defensive end at least looks likely to start against New England on Sunday. Watt recorded one tackle and played three defensive series in Saturday's preseason loss to the Rams. Analysis: Watt made his preseason debut Saturday, believed to be his only appearance before the regular season. He lined up at both defensive end positions before departing. The headline is that Watt came off the field under his own power and will be ready for the regular season opener Sept. 9 against New England. 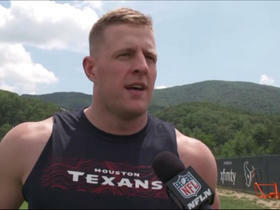 Watt made several impact plays during Wednesday's joint practice session with the 49ers, John Harris of the Texans' official site reports. Analysis: Watt made plays from both the right and left sides of the line, forcing San Francisco quarterback Jimmy Garoppolo into hurried and errant throws, or to adjust his delivery, or to throw an interception. The defensive end said earlier in the week that he will be ready to go Week 1 against the Patriots and backed up those words with his actions Wednesday. Watt reiterated that he has no doubt he will play Week 1 against New England, Aaron Wilson of the Houston Chronicle reports. Analysis: After missing 24 games the past two years, Watt was cleared to practice without any restrictions at the beginning of training camp. It's hard to say if he'll ever regain his historically dominant form of 2012-15, but there doesn't seem to be any question about his availability. Watt hopes to play in at least one preseason game as a tune-up before Week 1. 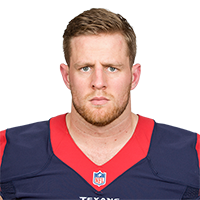 Watt (leg) is hopeful to play in at least one preseason game, Aaron Wilson of the Houston Chronicle reports. Watt (leg) has been cleared to practice without restrictions, Aaron Wilson of the Houston Chronicle reports. 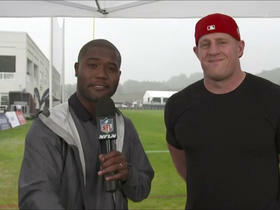 Watt (leg) aced his conditioning test Monday, reports ESPN's Chris Mortensen (via Adam Schefter). Watt (lower leg) is not expected to start training camp on the PUP list, Ian Rapoport of NFL Network reports. Analysis: Head coach Bill O'Brien has insisted over the last couple months that Watt will be at full strength before the start of the season, and the defensive end avoiding the PUP would mean he may be even further ahead of schedule than originally thought. Barring any setbacks over the next few months, expect Watt to be healthy enough to participate in training camp and remain on track for the start of the regular season. Texans coach Bill O'Brien reiterated Monday that he expects Watt (lower leg) to return at full strength, NFL Network's Good Morning Football reports. Texans coach Bill O'Brien said Watt (lower leg) is doing really well and should be back at full strength ahead of the upcoming season, Sarah Barshop of ESPN.com reports. Watt (lower leg) was deemed ahead of schedule in his rehab last week by head coach Bill O'Brien, John McClain of the Houston Chronicle reports. Watt (leg) resumed running in mid-January and remains on track to return in time for training camp, Sarah Barshop of ESPN.com reports. Analysis: Watt underwent surgery in October to repair a tibial plateau fracture in his left leg and still has significant work to do in the recovery process. The 28-year-old could return for Organized Team Activities this spring if everything goes smoothly, but the Texans are likely to proceed with extreme caution to manage the return of their franchise defensive lineman. Watt (leg) is on track for training camp and expects to start running soon, Aaron Wilson of the Houston Chronicle reports. Analysis: It remains uncertain if Watt will return in time for April's organized team activities, but the four-time All-Pro defensive end at least sounds like he'll be fully recovered weeks ahead of the season opener. 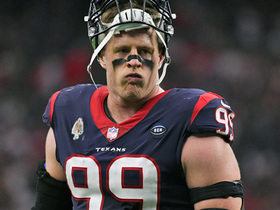 Watt (lower leg) said Friday that he'll be ready to play next season, but isn't certain if he'll be on the field for the start of Organized Team Activities in the spring, Sarah Barshop of ESPN.com reports. Analysis: Watt, who underwent surgery in October to repair a tibial plateau fracture in his left leg, only recently started walking without the aid of crutches, so he's not far along in the recovery process to forecast his return to practice. 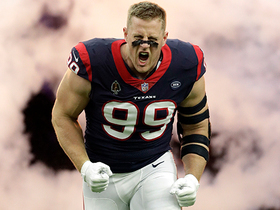 With Watt having been limited to a combined eight games over the last two years after sustaining a pair of season-ending injuries, it's fair to wonder if the three-time NFL Defensive Player of the Year will ever return to peak form again. 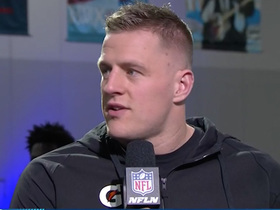 Watt (leg) walked on a treadmill for the first time since undergoing surgery in October to repair a tibial fracture, Aaron Wilson of the Houston Chronicle reports. Analysis: Watt posted a video of himself on the treadmill on his Snapchat account and included a caption with the words "Big day" and "first steps." The three-time NFL Defensive Player of the Year faces a full offseason of rehab and hopes to be ready to take part in Organized Team Activities in May.